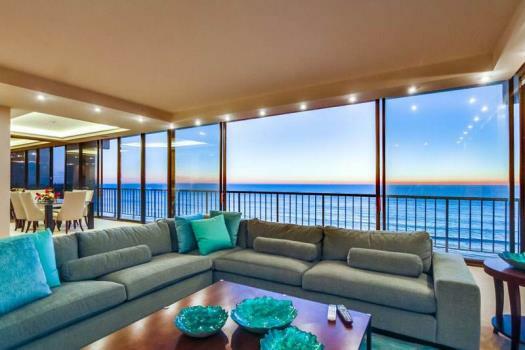 Sitting on the second floor of a bay-front complex, this beautiful, two bedroom, two bath condo sleeps up to five with a portable air-conditioning unit and a heater. The master suite has a queen-sized bed. The second bedroom has a queen-sized and twin-sized bed. There are three televisions throughout, high-speed internet, laundry facilities across the hall, and an elevator. Additionally, there is a modern kitchen, perfect for hosting and cooking meals. A luxurious pool overlooks Sail Bay, there is a community grill for summer-time cookouts. 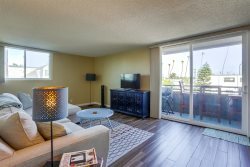 The community patio leads to the boardwalk, perfect for viewing a sunset, the Sea World fireworks, or a peaceful walk around the bay. This property is a 30 night minimum. There are two underground parking spaces. One small dog (under 25 pounds) is permitted.